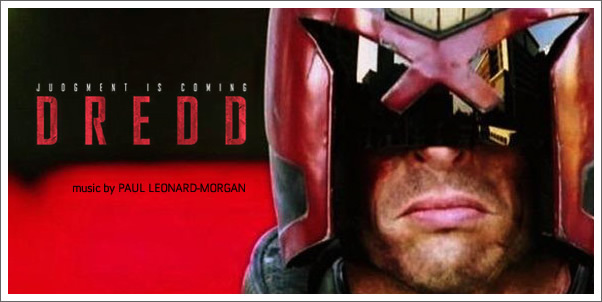 Metropolis Movie Music gives us a glimpse into composer Paul Leonard-Morgan's latest original score for DREDD. The original soundtrack will release in digital format on September 3 with the physical release following one week later on September 10. DREDD starring Karl Urban (Star Trek, The Bourne Supremecy, Lord Of The Rings), Olivia Thirlby (Juno) and Lena Headey (Game Of Thrones) was written by Alex Garland (28 Days Later, Sunshine). Garland also produced the film alongside Andrew Macdonald (Sunshine, Trainspotting) and Allon Reich (Never Let Me Go). DREDD was directed by Pete Travis (Vantage Point). DREDD (3D) will be released in the UK on September 7. Paul Leonard-Morgan is best known for his score for last year’s box office No 1 hit Limitless starring Bradley Cooper and Robert De Niro, and directed by Neil Burger (The Illusionist). This soundtrack earned him a nomination for the prestigious World Soundtrack Discovery Award. Previously he had been the composer for the BBC’s award-winning drama Spooks. Leonard-Morgan was also honoured by the US Olympic Committee when chosen to compose the official US Olympic Team Anthem (previously scored by John Williams) and was also commissioned to compose the music for the official launch ceremony of The Freedom Towers, the iconic designs which will eventually replace the Twin Towers at Ground Zero.